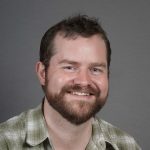 The Department of Chemistry congratulates Assistant Professor Matthew Bush on his promotion to associate professor with tenure, effective September 16, 2019. Research in the Bush group is focused on the development of new mass spectrometry technologies and their application to cutting-edge problems in structural biology. The field of native mass spectrometry, in which proteins and protein complexes are transferred to the gas phase in a way that retains many of the structural features of the proteins, has become one of the hottest areas in mass spectrometry. The Bush group has focused on some of the more fundamental aspects of ion mobility mass spectrometry (IM-MS) in order to elucidate and understand the types of information that can be gleaned from this approach and leverage it for application to biological problems. They are developing ion mobility methods and instrumentation and using advanced modeling approaches to improve understanding of the relationship between biomolecular structures in solution and biomolecular structures in the gas phase in order to achieve a fundamental insight of ion behavior critical for data interpretation. These efforts support the Bush group’s long-term goal of developing fast, sensitive, and general technologies that will enable a quantitative understanding of how the quaternary organization and structures of proteomes respond to disease, stress, and therapy. To learn more about Professor Bush and his research program, please visit his faculty page and research group website.